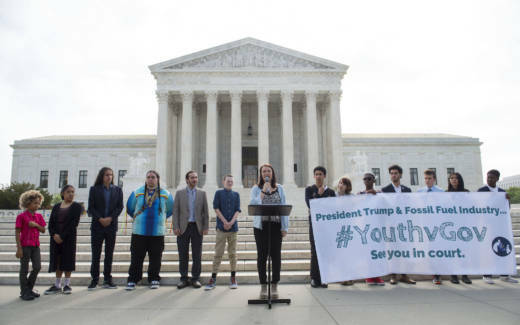 The Ninth Circuit on Wednesday ruled that climate suit brought by a group of 21 youth against the Trump administration can move forward. In an unusual move, the Trump administration had filed a petition with the Ninth Circuit asking it to review a lower district court's decision to let the case proceed. The administration argued that defending its climate change policy would pose too great a burden requiring "drastic and extraordinary" measures. "If appellate review could be invoked whenever a district court denied a motion to dismiss, we would be quickly overwhelmed with such requests," the three-judge panel ruled in a unanimous decision. The case will now move forward in the U.S. District Court in Oregon. The lawsuit, filed by nonprofit Our Children's Trust on behalf of the 21 youth, seeks science-based climate recovery plans by the federal government. The two-year-old suit, filed during the Obama Administration, argues that the U.S. government has been complicit for decades in the acceleration of global warming.